Eliminate the long cable that runs from the timer in the announcer's booth out to the scoreboard with the Wireless Scoreboard Interface. The interface works with any of our scoreboards when paired with one of our timer consoles made in 2005 or later. 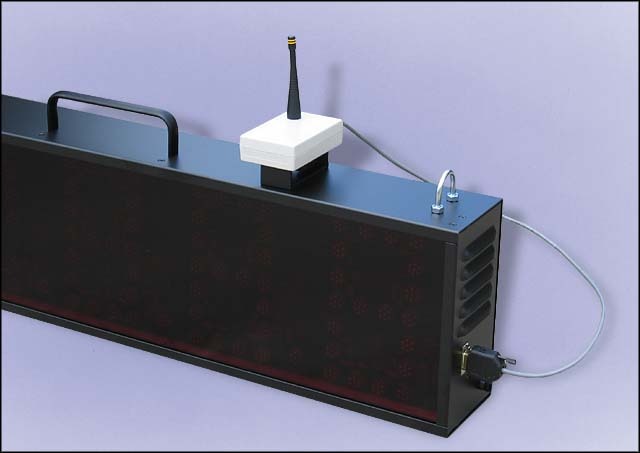 The Wireless Scoreboard Interface is a small wireless receiver that sits on top of your scoreboard and connects to the data connector on the side of the scoreboard in place of the long data cable. The wireless interface duplicates all functions of the standard cabled interface. No batteries are required – power is obtained from the scoreboard. You can continue to use your timer and scoreboard wired or wirelessly as needed. The wireless interface easily snaps on and off your scoreboard for use or storage. Please note that the Wireless Scoreboard Interface works only with Polaris and Allegro timer consoles made in 2005 or later. When used with one of our older light-bulb scoreboards (white lights instead of red lights), an AC adapter for the interface is required. Note the checkbox for this below. The Wireless Scoreboard Interface comes with the wireless interface unit, mounting bracket and short data cable as shown above. When used with one of our older light-bulb scoreboards, an AC adapter for the interface is required.